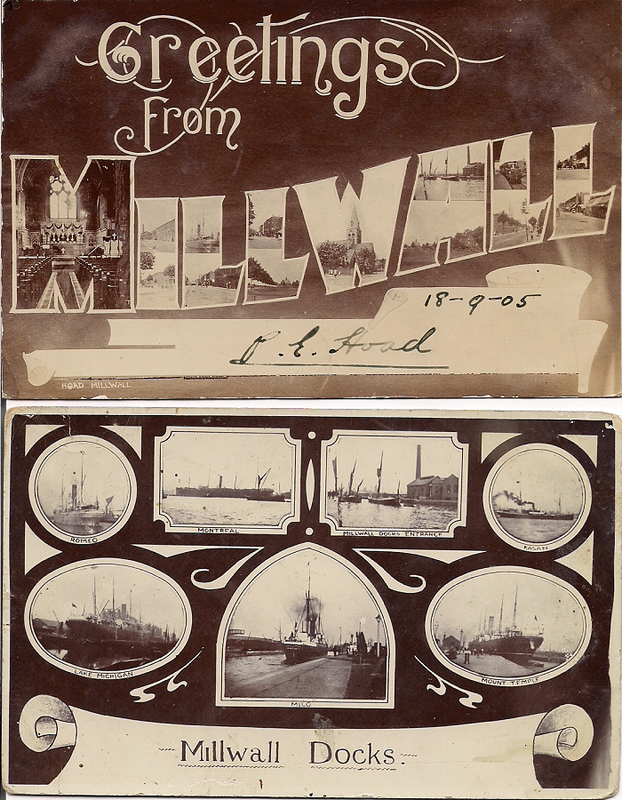 Many thanks once again to Eric Pemberton who has sent a fascinating set of postcards and photographs. 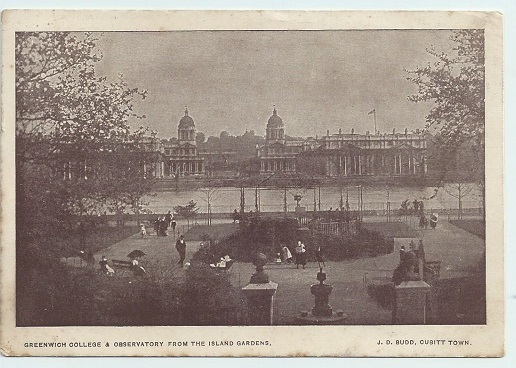 The first three show Island Gardens in the early 20th century, in the 19th century and early 20th century there were very little space on the riverfront that had not been taken over by industries. 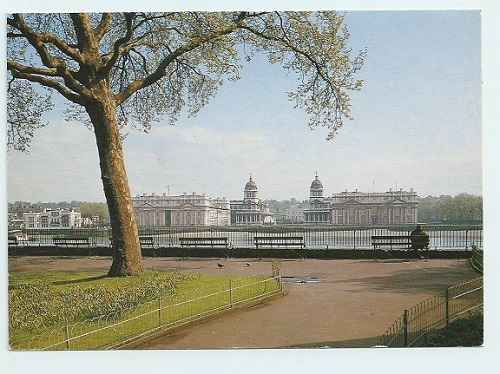 This small parcel of land had been protected due to the fact the land had been owned by the Admiralty who wanted to protect the view to and from Greenwich. Local MP Will Crooks and others fought to use this land to provide a park for local people. 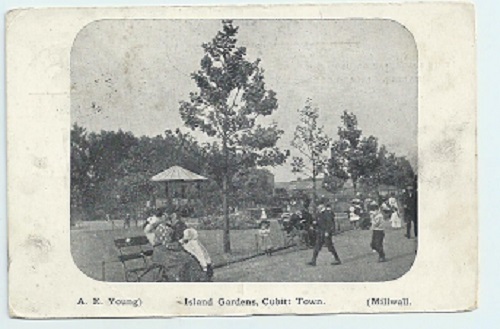 The postcards show the gardens were set up to be enjoyed by the local population and a bandstand was often used to provide music at the weekends. 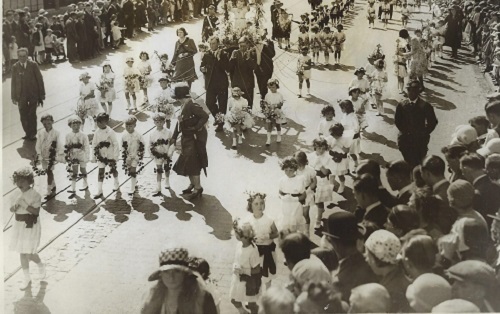 Great Catholic Procession through Poplar – Annual Event from the church of St Mary and St. Joseph processing down East India Dock Road July 1931. 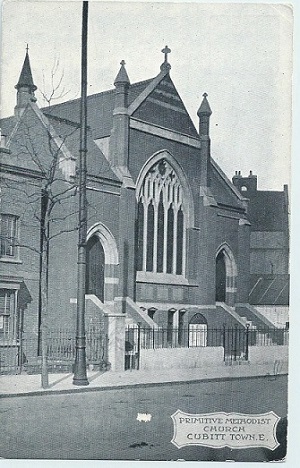 There was a chapel on the site from 1862 but was rebuilt in 1905, demolished in 1978. 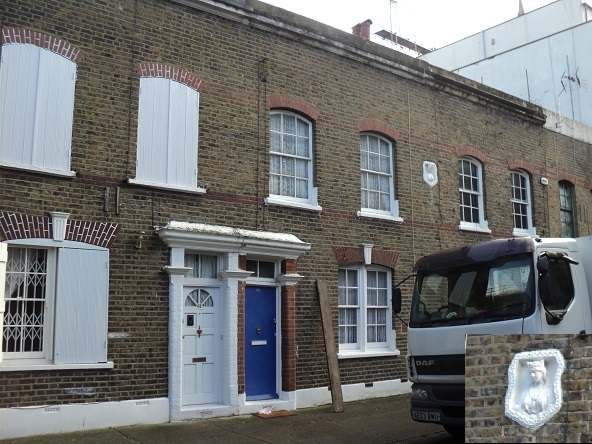 When I was asked by local writer Alfred Gardner if I would like to search for maidens in Stepney, I was not sure it was the type of thing I should get involved with. 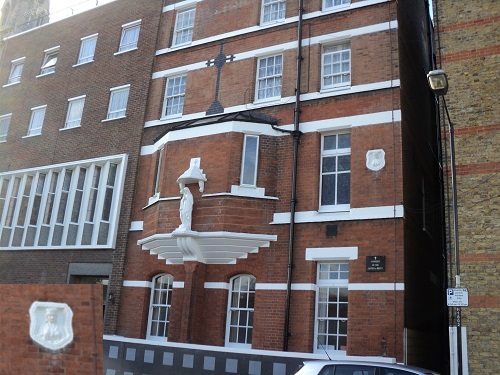 However after some explanation it seemed like a good idea, for we would be looking for Mercer Maidens and unearthing some of the connections between an ancient City of London Company, an ancient Church, a Convent and a local pub. The Mercers’ Company origins go back to the 14th century when it was a trade guild for those who bought and sold textiles and fabrics. Many in the guild were wealthy merchants who were granted a royal charter in 1394. One of the most famous early members of the Mercers’ was Richard Whittington who made a vast fortune from the trade. He was also one of the early benefactors using his money to provide schools and hospitals. Other famous Mercers include William Caxton, Thomas More, Sir Thomas Gresham and John Dee. In the 16th and 17th century the company became less involved in the buying and selling of textiles , but began to use its vast wealth for other business enterprises including funding expeditions all over the world. It also began to accumulate property in the City of London and a large area of Covent Garden was left to the company in the 16th Century by Lady Joan Bradbury. It was with the accumulation of property that the Mercer Maiden became familiar in London streets. 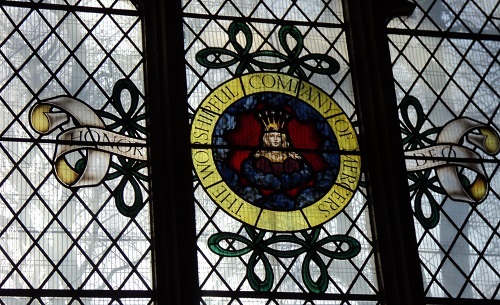 Although no one know the origin of the Mercer Maiden, it featured on the company seal from as early as 1425 and the company made the decision that the maid’s head would be displayed on its properties from the 15th century. Although featured on official documents, property and letterheads over the centuries, it was not until 1911 it would be featured as an actual coat of arms. Because of this the Maiden is often dressed in the fashion of the times she is created rather than one standard look. 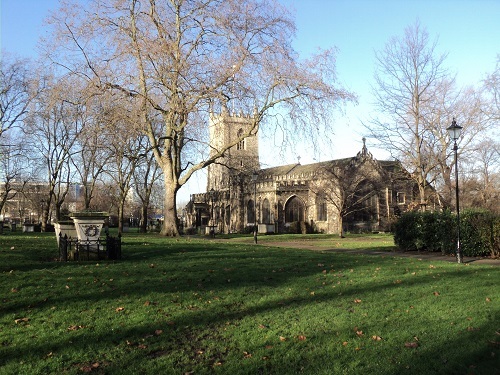 The Mercers’ presence in Stepney goes back to the 16th century when it was quite a wealthy area and Jon Colet a Mercer inherited a substantial estate from his father and founded St Paul’s School. 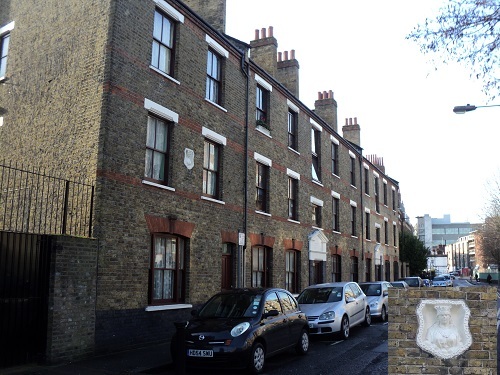 Other charitable concerns in the area were the Lady Mico’s Almshouses. 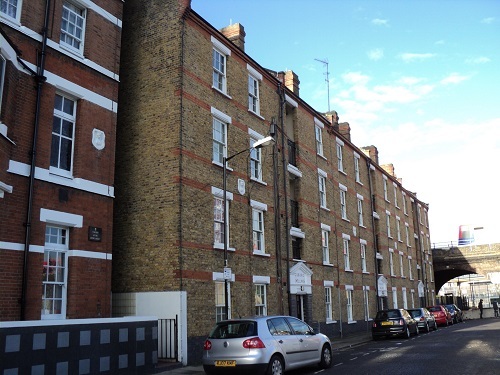 In the 19th century, the Mercers’ surveyor George Smith built a number of properties in Stepney that were let to ‘respectable tenants’ and gained a reputation of keeping the properties well maintained. 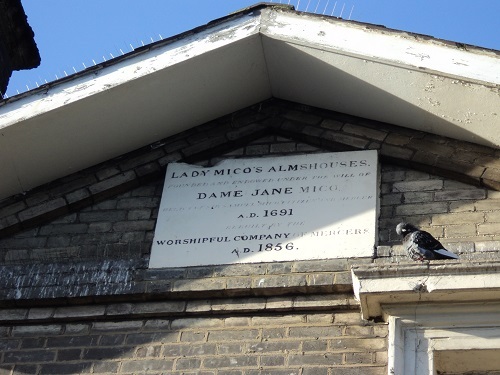 Lady Mico was the widow of Sir Samuel Mico, a wealthy mercer, she left £1500 in her will to found an almshouse in Stepney. 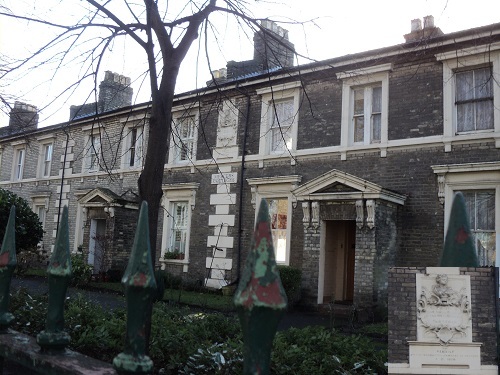 The Almhouses were built in 1691 and have been managed by the Mercer’s ever since. 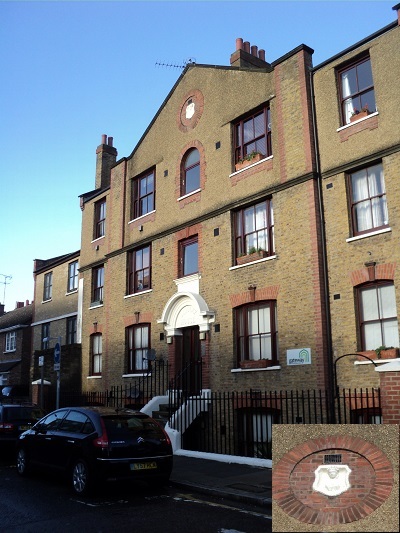 In 1976 it was decided that new accommodation was needed so a modern Lady Mico’s Almshouses was rebuilt on the corner of Alyward Street and West Arbour street. 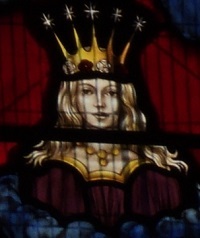 Over the road from the old Almhouses is St Dunstan’s Church, one of the oldest in East London dating from 952 AD, it is within the church that we find the stain glass window with a strangely modern looking Mercer Maiden, looking a bit like a Hollywood film star. The windows were designed and fitted in the 1950s. Alfred Gardner was bought up in Stepney and entertained me with many stories of 1950s and 1960s life in the area, as we travelled around the streets of Stepney. 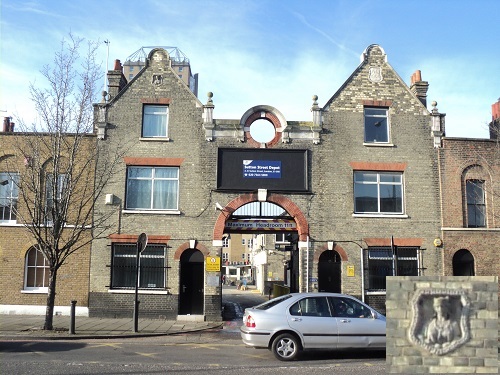 This Maiden was the source of some confusion, there are two former Mercer Arms, this one that closed as a pub in 1915 and the other one in Belgrave Street that closed in 2006. Hopefully we managed to track down all the Mercer Maidens in Stepney, but there are many other all over London especially in Covent Garden and the City. 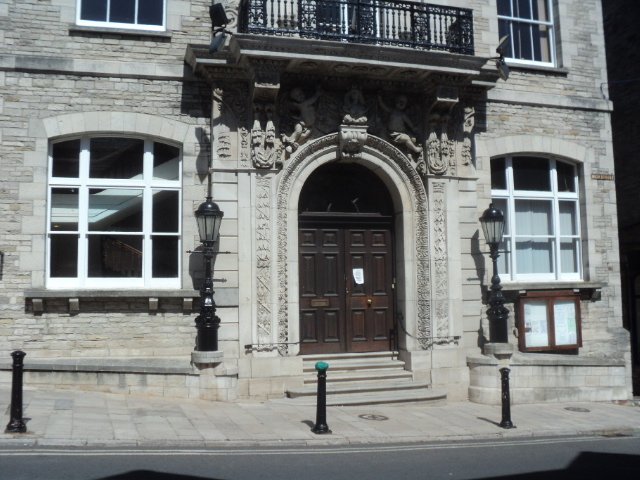 There is also one much further afield as I discovered in the summer when I visited Swanage Town Hall whose frontage had previously been part of the façade of the Mercers’ Hall in Cheapside. As regular readers will know, Trinity Buoy Wharf is one of my favourite places in London and just after Christmas I visited the Wharf on a cold grey winter’s day. It is never really busy at the Wharf, but on this particular day there was no sign of anyone, even the Fatboy’s Diner had a closed sign in the window. 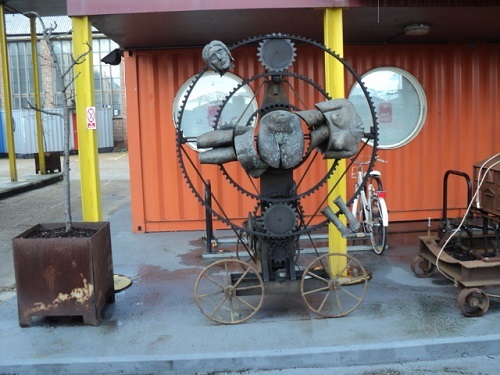 But one thing you can always rely on when you visit the Wharf is that you will find something new and slightly bizarre and there next to the Container City was a series of Sculptures. 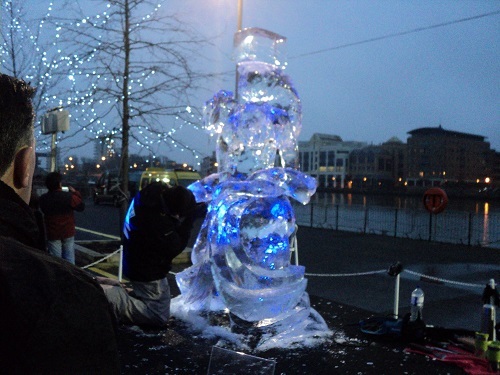 The Sculptures are created by Andrew Baldwin who is probably best known for his walking boat, a 40 foot boat that came out of the water and walked up the foreshore just below the Tate Modern. 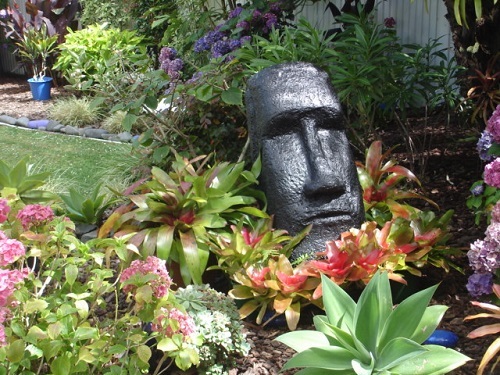 Andrew Baldwin trained as a Master Blacksmith and Welder and worked as such for 28 years before he turned his skills to making a number of large mechanical sculptures. 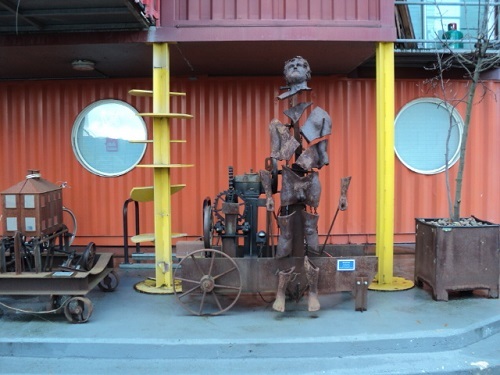 The Sculptures at Trinity Buoy Wharf are a series of his large mechanical models, in a strange way they are a bit of cross between a Heath Robinson type machine and Victorian clockwork toys. 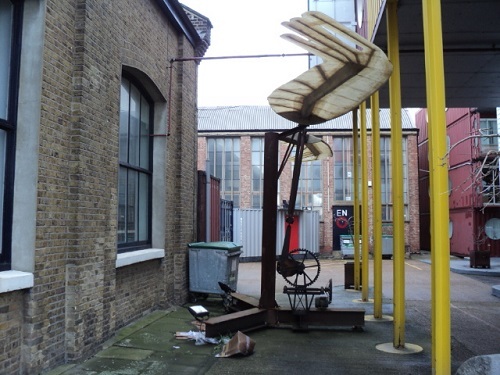 They really don’t seem out-of-place being near the Wharf’s workshops which were used for fixing various objects and machines but are now used for other purposes. Whilst looking at the strange mechanical pieces I glanced up over the Thames and saw another mechanical wonder the Cable car crossing over the dark grey skies. Anyone reading the British newspapers would think the British people were obsessed with immigration into the UK, however migration has been an important part of British life since prehistoric times. At various times it has been British people who have migrated in large numbers to all four corners of the globe for various reasons. 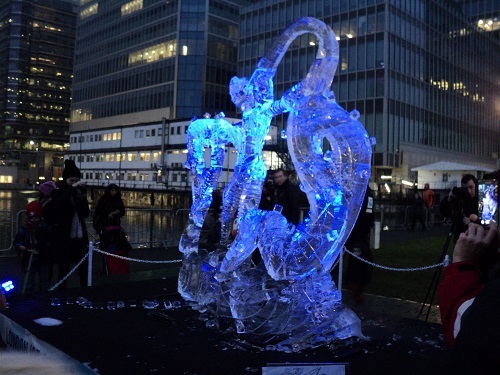 Many Londoners have joined this migration, in a previous post Coral Rutterford who was bought up in Poplar told us a little bit about her childhood and how in the 1960s she made a successful new life for herself and her family in New Zealand. 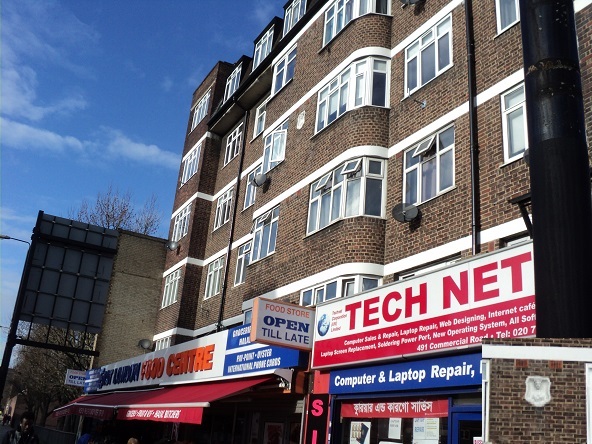 Coral has kindly written a short story about another Londoner who went to New Zealand over a 100 years earlier than she did whose migration did not have such a happy ending. 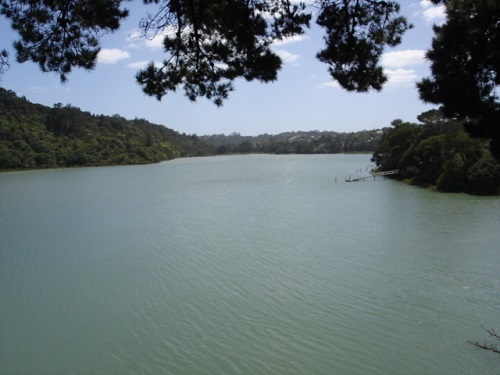 In the upper reaches of Auckland Harbour, also known as Waitemata Harbour ( which is Maori for sparkling waters), it divides and becomes streams and creeks as it hugs the coastline. One such creek, Hellyers Creek is some 7 kms long and has tree and bush clad hills on one side and some pine trees and mangroves and a sandy beach on the other. Here one can set nets and catch flounder, which is a flat fish and snapper and both are good eating fish. Stingrays and orcas have been sighted in these waters too, but it is considered safe and is used by many for swimming, boating or jet ski riding. The story of Hellyers Creek begins when Thomas Hellyer met James George in Tasmania where they both disliked the convict settlement and so they later decided to move to Adelaide but they found the climate was too hot and they became tired of the flies. They heard from a sea-captain that New Zealand was a green and pleasant country and decided to see for themselves. Both men came from London originally and they noted as they sailed into Auckland that there were a few shacks on the coastline and therefore decided to go to one of the islands that are within Auckland Harbour. There they built a hut or shelter until they decided what to do. 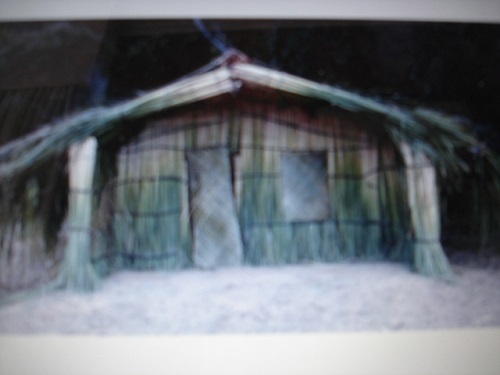 The local Maori would bring food to Waiheke Island where they stayed there for some 8 months. Over this time there is evidence the two men were considered to be rough, loud and uncouth and disrespectful to the Maori, name calling and ill-treating them. Hellyer and George were among the first white men to buy land on Auckland’s North Shore. This was before Auckland was founded later in September of that year. In November 1840, Hellyer returned to the creek and took with him 4 sawyers and built a saw pit, a hut and a workshop and fresh water was available in a nearby lagoon and so opened a brew house which became popular amongst the sailors who rowed across the harbour for a beer even though it was quite a distance by rowing boat. One of the sawyers went on a spree on Christmas Day stealing timber and selling it and was recognised as a New South Wales escaped convict and was later sent back to Sydney where he was hanged. The tall kauri trees grow straight and very tall and are now a protected species and the timber is prized for hand carving. Explorers like Captain James Cook who was the first white man to set foot on NZ soil used these tall trees for spars and masts on his tall sailing ship as did others who followed in later years. 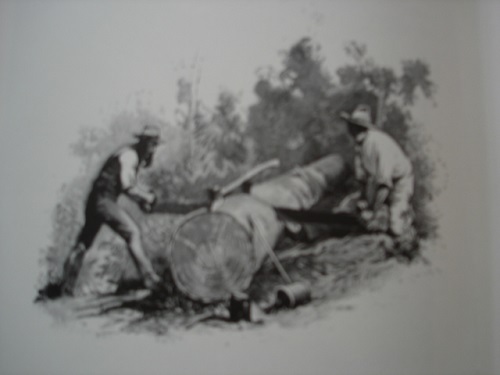 Settlers in New Zealand were prevented from selling off trees immediately by the Superintendent of Public Works and officers who marked and measured the kauri trees by the water’s edge and so locked up the industry. Thereby curtailing the felling of the trees as Hellyer was keen to start up with what he considered a profitable business in the growth of Auckland as a new town at that time and settlers arriving. James George moved to the now Auckland district and opened a bakery. He relied on firewood that Hellyer sent across the harbour to heat the ovens. As a new colony the price of provisions was high, a 2 pound loaf cost 1/3d, flour was 40 pounds a ton and butter cost 3/6d a pound. Other items available at that time were eggs at 2/6d a dozen and beef sold at 1/4d a pound by Jones the rat catcher. Beer cost 4 pounds 10 shillings per hogshead which is at least 63 gallons, possibly more. A year later on 22nd December 1841 Thomas Hellyer was found dead at “The Retreat” supposedly killed by a tree falling on him while he was in his boat. The fact that his watch, boots and brandy were stolen indicated that it was not an accident. An inquest was held at the Exchange Hotel, Auckland, a man was held and questioned, but strangely runaway sailors on the property were not questioned and no one was ever charged with his murder. Hellyers younger son took over the business but it later failed. In 1845 William C Daldy a man born in Essex bought the property and later became an entrepreneur and traded around the New Zealand coast. He lived with his family at “The Retreat” site and gradually built a home over many months. He sailed around the coast in trading ventures and used dungaree as his sails. He later took part in local politics and was outspoken and became a Member of the House of Representatives and became first chairman of the Harbour Board and founder of an insurance company. My house overlooks Hellyers Creek and it is a peaceful, gentle spot, the bushland across the creek is a bird sanctuary and a large collection of birds can be seen in our garden daily, grey heron nest in the tree lined bank, colourful rosella parakeets chatter as they fly overhead or feed on new leaf shoots in the spring. Sparrows by the dozens, blackbirds, starlings and thrush all live at our place and its hard to believe that a murder could have occurred in such a beautiful place. Bush walks alongside the creek today are popular and many such tracks are available around the Auckland coastline. The Christmas episode of Call the Midwife about an unexploded bomb in Poplar was a reminder that although the War ended in 1945, there are occasionally dangerous relics from those days that still make an appearance. It was estimated that the German airforce dropped 22,000 tonnes of Bombs onto London, of this amount it is estimated that at least 10% failed to explode either due to faulty parts or they were deliberately sabotaged by workers in Germany. According to the Bombsight records 755 High explosive bombs, 20 Parachute mines and 20 incendiary bombs were dropped on Poplar in the Blitz during the Second World War. This high number caused considerable damage and loss of life but it would have been very difficult at the time to trace the unexploded bombs that buried themselves underground or fell into the docks. The problem of unexploded bombs was a source of concern when the war ended, this is illustrated by this strangely upbeat newspaper report from 1950. Mother Brown hears a ticking. Neither she nor the family can locate it. They, and the neighbours, recall the big bomb that dropped nearby 10 years ago. They rush out and call the Bomb Disposal Unit, and a bomb disposal squad of the Royal Engineers is soon on the spot. No, Mother Brown’s bomb is not flagged on their UXB (unexploded bomb) map. But, then, it might have been missed. Can’t afford to take any chances. 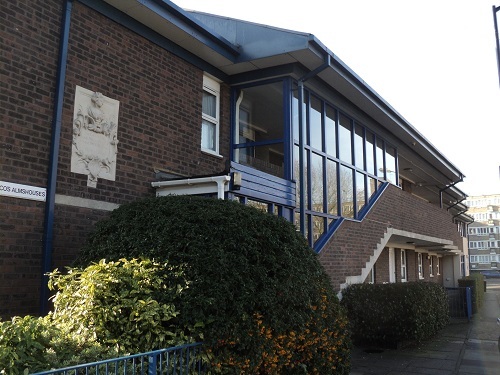 Householders in the area are closely questioned. Instruments are produced to ‘listen’ for the bomb. If need be, digging starts, and the area is cleared. If there is a bomb it is quickly de-loused and removed. But the chances, these days, of Mother Brown’s bomb being a genuine article are pretty slight. The ticking that troubled her is likely to be no more menacing than the ticking of the mattress in her best front bedroom. There are not many bombs that are not meticulously marked on a master map that hangs on the wall of a Sussex cottage, HQ of Britain’s still active Bomb Disposal Unit. The flags on that map mark the locations of 124 suspected bombs lying yards down under Britain, 30 of them in the London area. These are the remnants of the 24,000 unexploded bombs that have been destroyed in the 10 years to 1950, the harvest of 40,000 reported suspects. There are still, however, plenty of Mrs. Browns. There is an average of six reports of suspected bombs a week. About a quarter of them are confirmed. 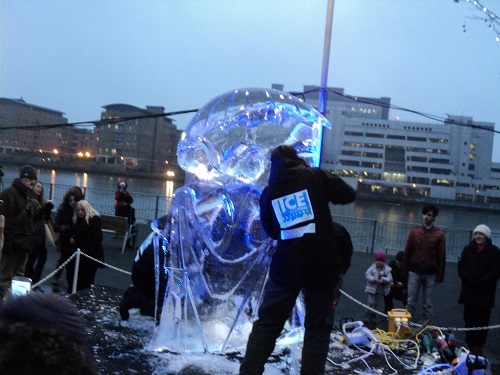 This highly specialised work still costs Britain a packet of money. Every time a bomb disposal squad, with its equipment, goes to investigate a report, it costs about £400. If there is a bomb and it is removed, that sometimes costs another £2100. Each discovered bomb brings its crop of reports from roundabout. The Mother Browns can’t be happy until they have one, too. Removing a bomb even 10 years after, can be as dangerous as it used to be. But generally, with the aid of accumulated knowledge and new equipment, the trained de-louser is more in danger of a dropped spanner than of a good old-fashioned cru-m-m-p. 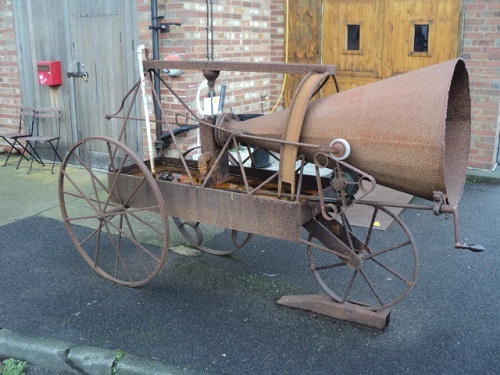 There have been no casualties in the Bomb Disposal Unit since January, 1948. Before then, there was quite a toll. Thirty-five officers and 211 other ranks were killed. On mine disposal work, 151 were killed. Mine disposal is now considered one of the disposal boys most ticklish jobs. Since they started lifting minefields in 1945 61,000 mines have been removed from 37 fields, including holiday beaches and cliff top walks. 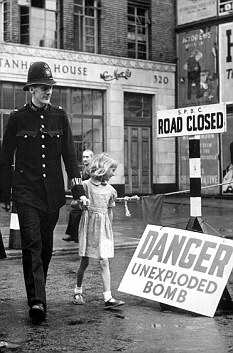 Meanwhile the big signs that say: ‘Keep clear, Unexploded bomb,’ occasionally, but less and less frequently, appear in London back streets and empty the local population into a deliciously exciting vigil in the nearby pubs. Mrs Brown’s ticking be comes less and less distinct. 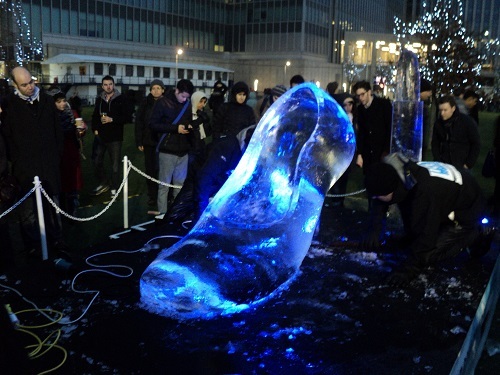 One of the most dramatic Unexploded Bomb episodes took place in 1957 when a bomb was discovered in West India Dock. A Port of London diver doing a routine inspection of the dock found the bomb half buried in mud, due to the fact that it was a magnetic ‘G’ mine it was not possible to bring to the surface as it possessed a mechanism that would have detonated it. For eight hours in freezing cold waters a team of bomb disposal divers worked to make it safe. In recognition of their bravery the team was honoured, Cdr Gordon Gutteridge was appointed an OBE, Lt Cdr Terrell and Lt Heatley MBEs. PO Cobby, Leading Seaman Alderton, Able Seaman Harris received British Empire Medals. In the late 1950s he served as senior diver in the mine hunter HMS Brenchley, which was attached to the 51st Minesweeping Squadron but in 1957 he was called from the classroom where he was taking his officer exams and sent to West India Dock in London. A huge German mine containing 1570 kilos of explosive had been found lying in the mud and was highly dangerous. He immediately ordered that the area be evacuated and he and his colleagues from HMS Brenchley displayed nerves of steel. They worked by touch and feel in the pitch dark and unlit water in rotation and made repeated dives on the mine. They had to treat the bomb as though it had multiple fuses – it could easily have blown up at any moment. He was awarded a BEM for his skill and bravery. 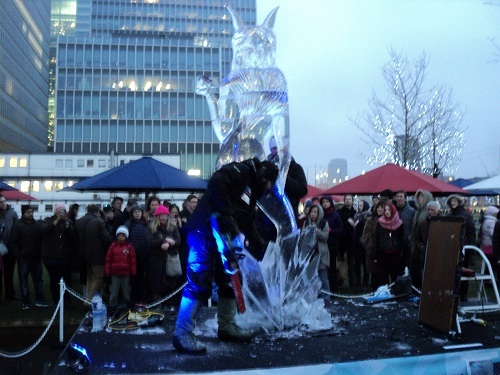 Recent development of Canary Wharf and the Isle of Dogs has meant that construction firms are now digging deeper to build foundations for large developments. 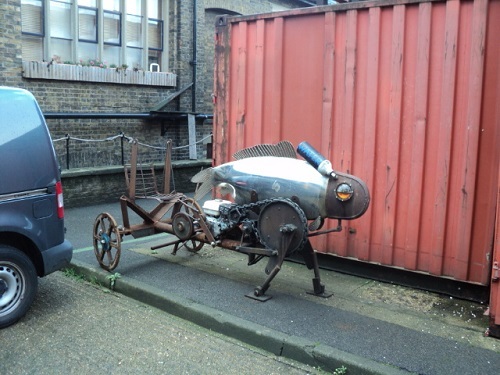 In 2007 one construction firm came across a German V1 Doodlebug that had laid under the ground for over 50 years, a BBC report of the time gives more information. 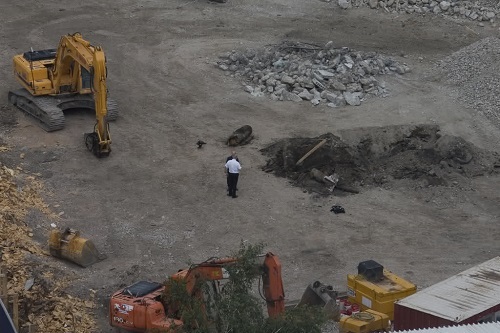 Police have set up a 400-metre exclusion zone in Docklands after the discovery of an unexploded bomb dating back to World War Two. 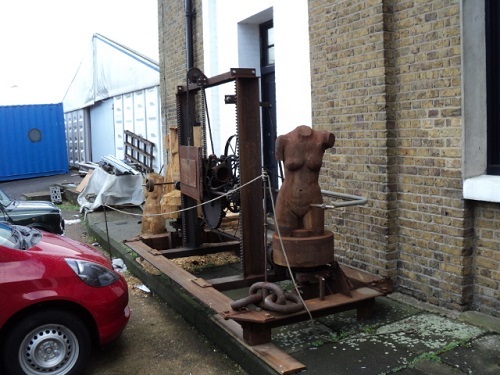 The bomb, believed to be a ‘Doodlebug’, was unearthed on a building site on the Isle of Dogs. 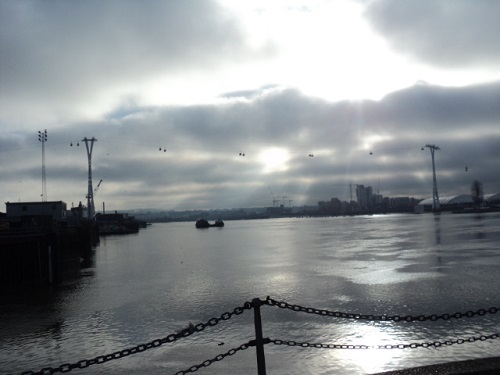 London’s docks were a major target for German bombers during the 1939-45 war and many unexploded bombs have been discovered in the area since. They were also known as ‘buzz-bombs’ because of the distinctive drone of their engines. Police expect the exclusion zone to remain in place until Sunday, when it may be extended while disposal work is carried out. 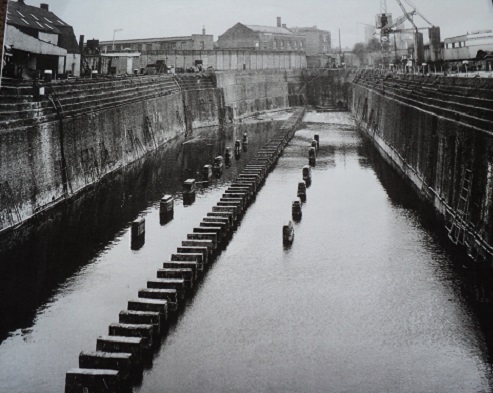 In a previous post I told the story of the London Graving Dock with the help of a writer who worked there in the 1950s. The writer David Carpenter sent me some of his memories of the area at the time and it is my pleasure to publish the first part of his reminisces . David’s memories remind us that the Docks were foremost a busy and sometimes a potentially dangerous place to work. Today, anyone who lived and worked in the vicinity of London’s Isle of Dogs during the middle of the last century would find it hard to recognise the area as it is today. Gone are the fine ships and infrastructure that made the area such an interesting and exciting place to work. 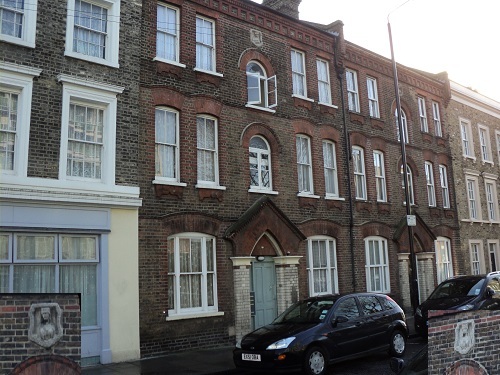 The magnificent Victorian architecture that survived the Second World War has virtually all disappeared. This has been replaced by futuristic looking glass fronted megaliths that are inhabited during normal working hours by the upwardly mobile office personnel who have no conception of how important the area was in the past. Fortunately the sugar warehouse stacks on West India Docks North Quay, designed by George Gwilt has been preserved and are now home to the Museum of Docklands. How different the skyline is today compared to the 1950’s when ships funnels and a network of dockside cranes dominated it. 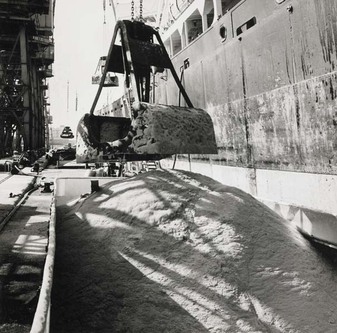 I started my apprenticeship with The London Graving Dock Company in 1955. Their yard was adjacent to the Blackwall Basin, all that now remains of this premier ship repair firm is the remnants of the dry dock, now nothing more than an ornamental duck pond, bordered by unaffordable housing. I spent two years in the huge machine and fitting shop before going ‘outside’ to work on ships in the various dock systems on the Thames. 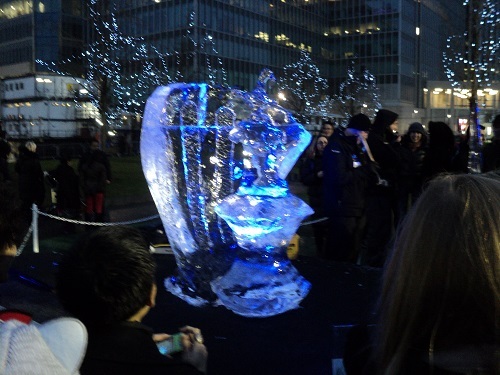 I regularly worked on vessels berthed at Canary Wharf, the North and South Quays and Monkey Island which was the quay between South Quay and Canary Wharf. During my time in the fitting shop, my lunch times were divided between the P.L.A. canteen, which was situated just inside the West India Dock on the east side of the entrance locks. Kate’s Café, known as Auntie Kate’s, which was adjacent to the West side of the locks and accessed via a ‘secret’ removable section of the dockside railings, and then there were ‘Harriet Lanes ‘, which was a pie stall almost opposite the entrance to the Graving Dock in Preston’s road that was named after a woman who fell into the machinery of a Chicago meat works. 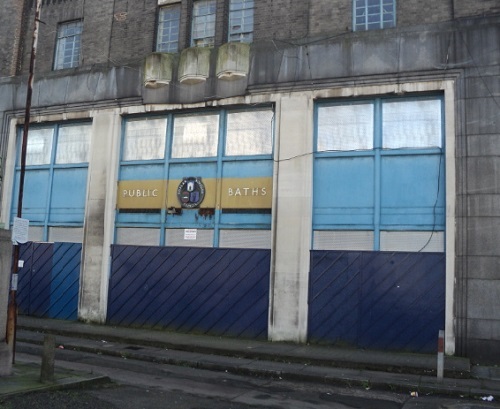 Together with other apprentices I often visited Poplar Baths for a lunch time swim via a short cut on the north Quay and across the railway shunting yards that now accommodate the new Billingsgate Fish Market. As apprentices we also had to attend Poplar College one day and one evening a week. On these occasions I used to have my meals in the Farinas Café just to the left of the Blackwall Tunnel entrance and opposite the entrance to the East India Dock. The food there was excellent , the steak and spaghetti bolognaise could not be bettered , it was always thought to be horse meat, probably illicitly obtained from the West India Dock where the huge carcasses were to be seen hanging in rows awaiting shipment. They were always dyed with a green substance to make sure they were not used for human consumption. We often wondered if it was this that gave the meat its unique flavour! 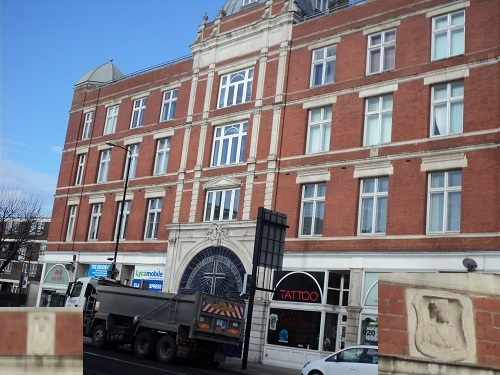 During my spell in the fitting shop I occasionally had to go up to ‘Davy’s ‘the ships chandlers at the top end of West India Dock Road for odd bits and pieces. This necessitated a walk through the huge open sided timber storage sheds, then across the swing bridge at the top of Blackwall Basin and up the North Quay to the main gate at the bottom of West India Dock Road. George the charge hand always used to say, “Watch your step and mind how you go “. It was good advice! 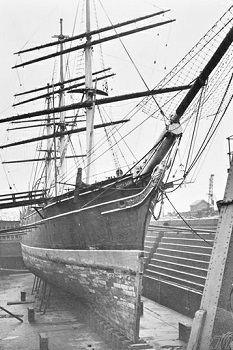 As it could prove very dangerous, after walking around Junction Dock (now filled in) I had to dodge through the timber sheds with the steam cranes swinging bulks of timber onto waiting lorries, then over the bridge to the north quay where there was usually four or five foreign registered tramp ships unloading a variety of cargoes, such as fish meal and animal hides. After the sweet smelling timber sheds, the stench in this area was appalling, then further up the quay came the pungent aroma of molasses from the sugar warehouses. Once out of the dock gates and past Charlie Brown’s pub, I had to negotiate through China Town with its rich and appetizing smells drifting out of the numerous restaurants and cafes. 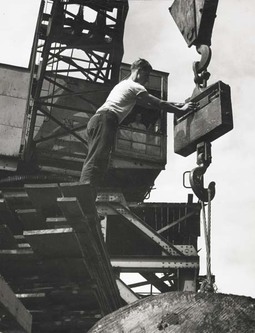 On top of this there was the continuous business like noise emanating from the whole area, the quick sharp sound of tugs whistles as they signalled to each other, then the shrill sound of the whistles from the hatch masters as they signalled to the crane drivers as to where they lowered their gear into the ships holds, added to this was the continuous rattle of the steam winches coming from nearby ships as they swung their derricks outboard discharging goods from all parts of the world into waiting lighters (barges ) destined for upriver warehouses. Then there was the sound of high pressure steam escaping from the safety valves high up on the ships funnels as their engineers worked to keep their boilers ‘on the blood’ endeavouring to keep the winch men satisfied. 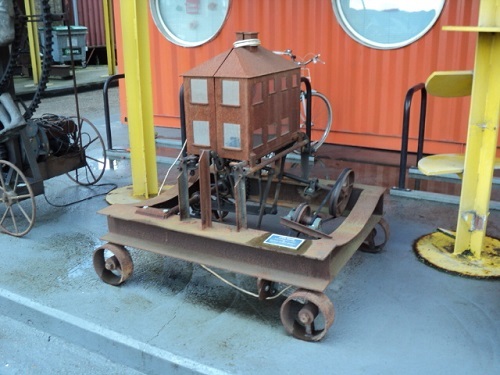 Mixed with this was the clatter of railway goods wagons as they were shunted around the sidings that covered the area between the North Quay and Poplar High Street. To the ship enthusiast, Davy’s was an Aladdin’s cave of nautical treasure, immediately on entering you were hit by an intoxicating aroma of tar, hemp, and paint and a visual impact of polished brass. It was a truly magnificent establishment. In the 1950’s I was a dedicated follower of fashion , I always had my suits made to measure in Phil Segals at 225 East India Dock Road, where Phil and his son, Stan tailored the finest suits in the East End and probably the whole of London. 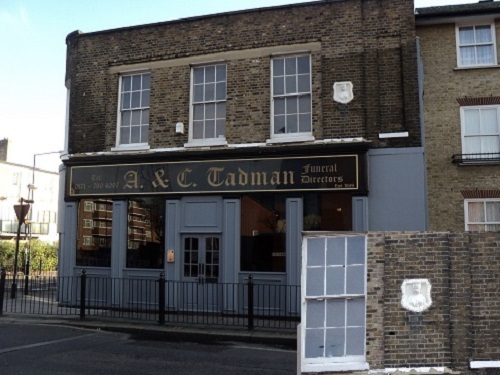 This stretch of the East India Dock Road was full of tailor’s shops, if you stopped to admire their window displays you would be immediately accosted by the proprietor with tape measure in hand, ready to measure you up and at the same time ushering you to his threshold in a condescending manner. 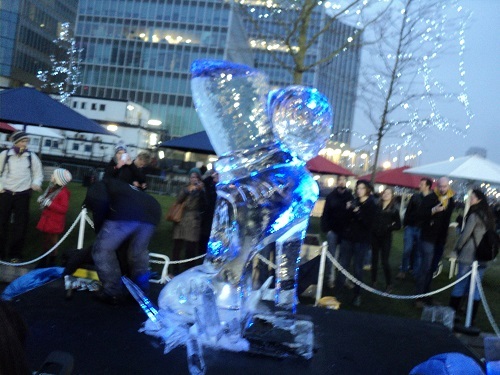 On the third day of the Ice Sculpting Festival at Canary Wharf it is decision day when the judges decide who will win the trophies for the competition. 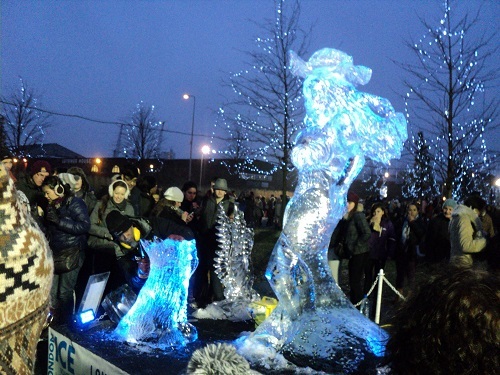 The large crowds continued today, with the sculptors working hard to refine their sculptures. 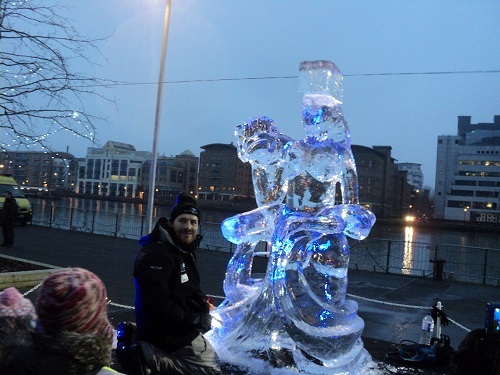 The Ten international teams were representing countries such as the United States, Sweden and Poland. 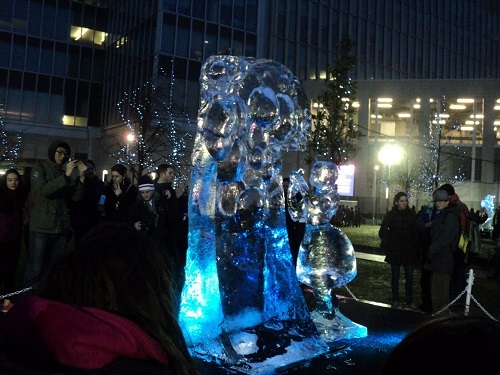 The results will be announced at 5 o’clock on Sunday evening.